A friend of mine is having a baby and so most of May has been spent getting things made for the baby. Now i don’t think they are like huge fans of handmade things but not totally against it either so i decided to make a few things that are more useful. 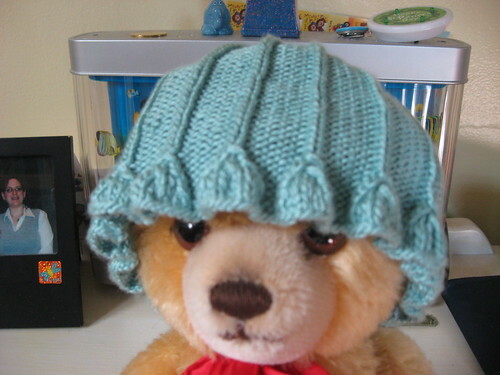 But before that i had to make a hat. 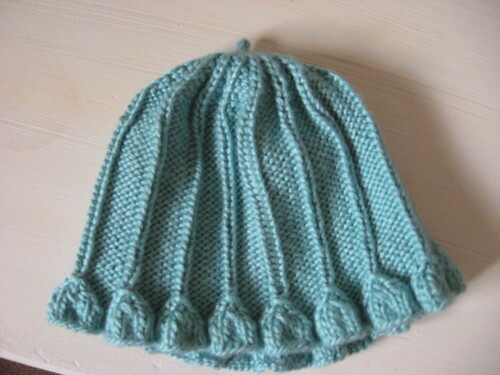 Pattern: Soft Baby Hat by Gina Macris in The Elegant Knitter. My mom has this book and i mentally bookmarked this pattern so i could make it and lucky for me the chance came quickly. 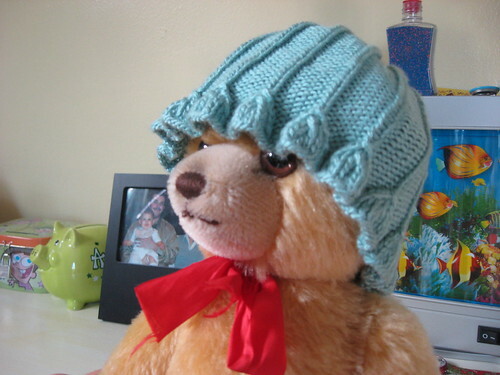 Notes: Super Cute Hat and the yarn i used makes it nice and soft. I love how the ruffles came out. BUT this hat was a pain at first. I don’t have any size 5 24 inch circulars. I did try my Denise interchangeable but they are kinda rubbery and my yarn was sticking to the needle and cord like crazy making it really hard to move my stitches along. then i tried my 29 inch circs at least until i got past the first couple rows and that went okay. I then transferred everything to some double points. Everything went pretty well but i highly recommend making this hat on circs or moving your stitches around so that way you don’t have a knit stitch at the end or beginning of a needle. Why? well if you look closely at the first picture you will see a knit strip that looks kind of blown out in comparison to the others-it was at the end of a needle and i think maybe i was knitting to tight to make sure i get no ladders and it ended up being too tight. There are only 3 columns like that but still i would take the time to get the right size circs before making this hat again. Also the yarn was kinda sticky even on my metal needles so i might use some yarn that moves smoother next time as well. One small change i made was at the end of the ruffle you are supposed to do a k3tog. There was no way i was going to be successful at that with my needles and yarn so i did Slip 1 k2tog psso. I think it came out just as well. I am very happy with how it came out and hopefully i will get a chance to see it on the little one when she arrives-My friend is counting down the days. 10 more but she is more then ready now. Adorable hat and totally worth whatever annoyance it caused in the beginning. I bet your friends will love it.